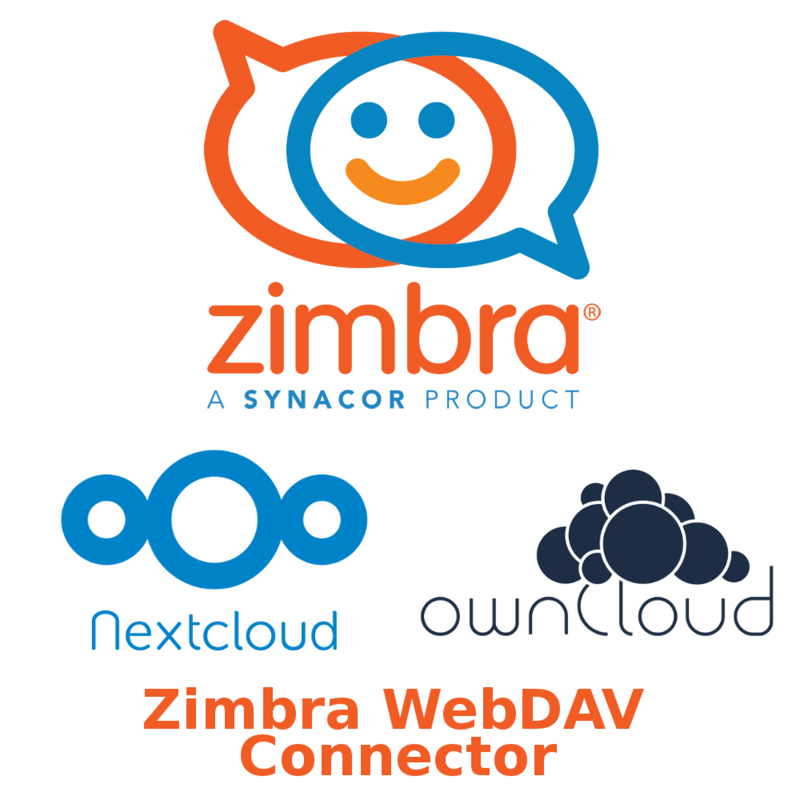 Integrate any WebDAV server in Zimbra Collaboration, currently tested with ownCloud 9.1, Nextcloud 14-15, Alfresco Enterprise - 5.2.0 and Nuxeo. The zimlet and extensions support multi server ZCS cluster setups where proxies and mailboxes are in different machines. The zimlet and extensions should only be installed on the mailbox servers. The zimlet and extensions must be installed on all of your mailbox servers (refer to the Installing section). Non interactive mode does not enable experimental Libreoffice document preview, automatically installs the Zimlet (in production mode) and force enables it in all COS'es. It also installs public link sharing. Using Zimbra WebDAV Client you can preview and edit docx,xlsx and pptx directly from the Zimbra UI using the power of OnlyOffice by configuring your OnlyOffice Document Server API url in owncloudzimletonlyofficeapiurl. 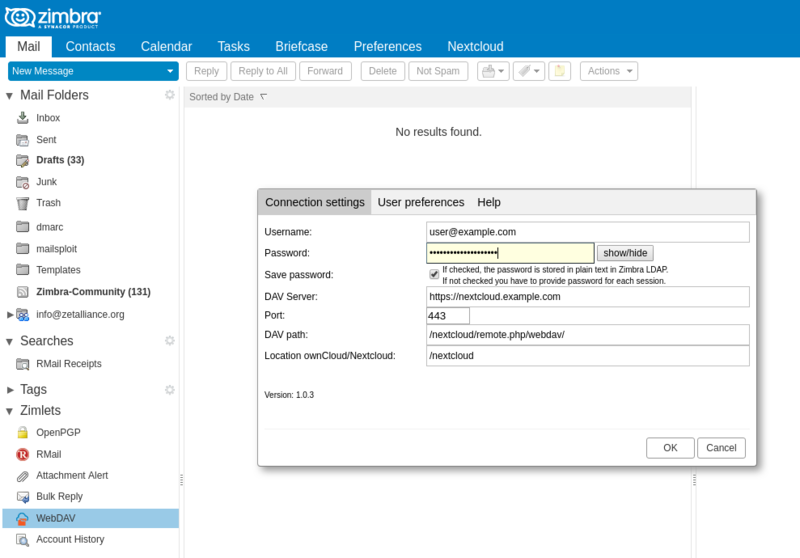 See owncloudzimletenable_onlyoffice below. 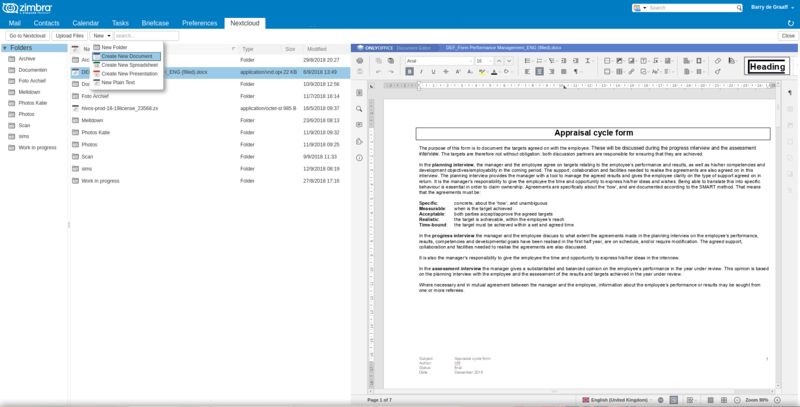 Zimbra WebDAV Client uses OnlyOffice, LibreOffice and jsPDF to display previews of your documents. To enable LibreOffice preview, re-run the installer and choose Y when asked to install LibreOffice Document Preview. Previews are supported for the following file types: pdf,jpg,jpeg,png,txt,md (markdown rendering). Video playback results may be poor supported types: mp4 and webm. If you enabled the optional LibreOffice conversion in the installer, these file types are previewed as well: docx,doc,xlsx,xls,pptx,ppt,odt,ods,odp. On CentOS 7 only (see extras folder): djvu. On top of that the Zimbra WebDAV Client supports editing and redering plain/text and markdown documents. 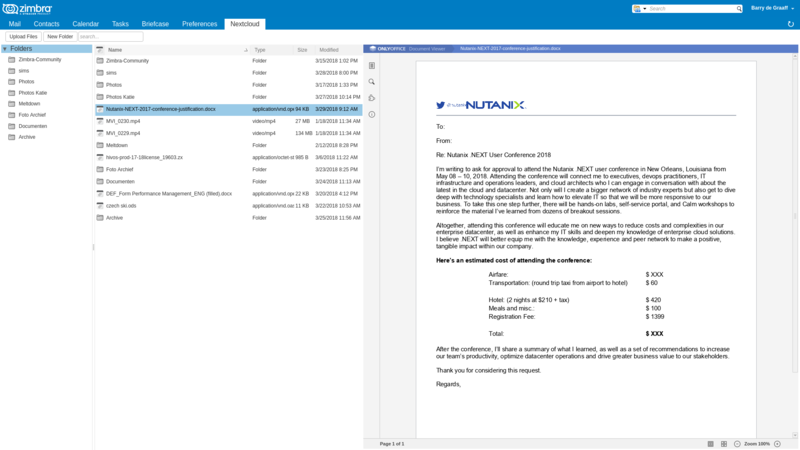 Zimbra WebDAV Client sends all requests to Nextcloud with an X-Forwarded-For HTTP header. 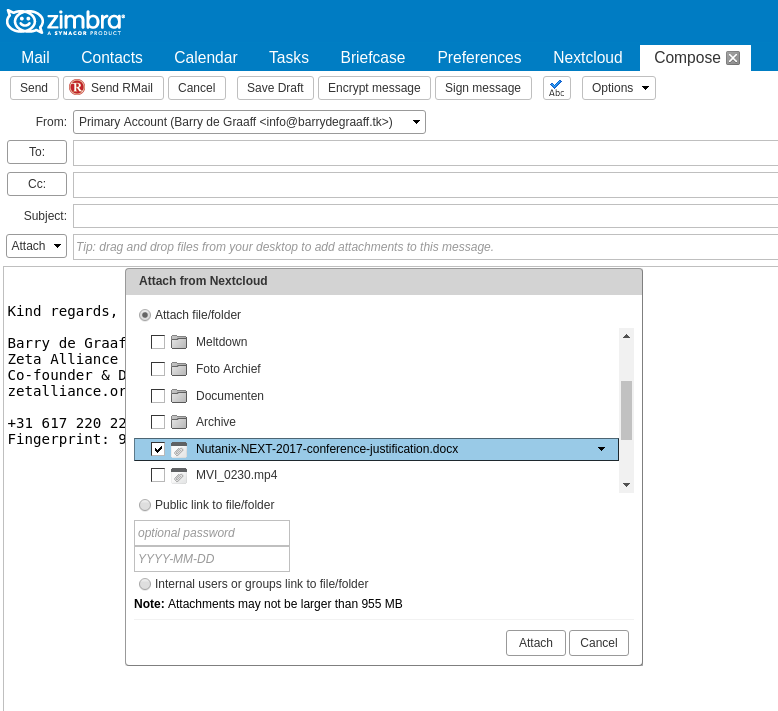 You must configure Zimbra and Nextcloud properly to avoid problems with Nextcloud's bruteforce protection mechanism. You do not need to restart anything after changing these IP. No service restart is needed after changing this file. The Zimbra WebDAV Client uses built-in language strings from Zimbra, as such it is translated for all languages that are supported by Zimbra. Passwords with characters like @ will not work, try to install this using a simple account and password (A-Za-z0-9). fixed in 0.6.2. Error 500 but some features work, if you use ownCloud external storage, make sure it is available and marked green. Running a WebDAV server behind and NGINX reverse proxy (from CentOS or Debian) won't work, it will work when proper options are enabled (as for example with zimbra-proxy, also based on NGINX). It's an amazing Zimlet from Zeta Alliance as usual. Congrats ! It worked perfectly on Zimbra 8.8.4 beta.